Sitting high on a hill since 1834, Taj Savoy Hotel spreads over 6 acres of landscaped gardens in Ooty. This quiet English-style retreat exudes old world charm, yet provides facilities like a spa and a 24-hour gym. Housed in charming cottages, all guest rooms are fitted with heating or a fireplace. A satellite TV, minibar and personal safe are included. Bathrooms come with a shower or a bathtub. 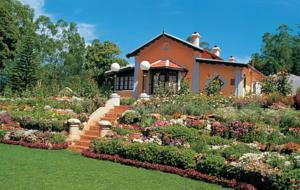 Taj Savoy Hotel is 2 km from Ooty Railway Station, and 3 km from Botanical Garden and Ooty Lake. It is 350 km from Bangalore and 105 km from Coimbatore Airport. Parking is free. On-site activities include table tennis, badminton, basketball and billiards. The hotel also provides car rentals and a tour desk. Laundry services are available. International dishes are served at the Dining Room, which also offers live piano music on certain evenings. Indian, Chinese and Continental dishes can be sampled at The Lounge. Canterbury Bar offers wine and cocktails. Rooms: Hotel Rooms: 40, Hotel Chain: Taj Hotels & Resorts. Wi-fi is available in public areas and charges are applicable. Free! One child from 5 to 12 years stays free of charge when using existing beds. One older child or adult is charged INR 1500 per night and person in an extra bed. Maximum capacity of children's cots/cribs in a room is 1. Maximum capacity of extra beds in a room is 1. Any type of extra bed or child's cot/crib is upon request and needs to be confirmed by the hotel. Supplements will not be calculated automatically in the total costs and have to be paid separately in the hotel. American Express, Visa, Euro/Mastercard The hotel reserves the right to pre-authorise credit cards prior to arrival.